Staunton is without doubt the most iconic and recognisable chess set in the world. The Regency Chess Company has always stocked a superb range of Staunton chess sets, in fact we have specialised heavily in this area. We believe that we have the best and most comprehensive range in Europe. There is often a common misconception among customers that there was a company called 'Staunton' who manufactured chess sets. There was no such company. Staunton was the world's number one chess player in the mid 1800s and was famous for playing chess and writing about it in the national press. Staunton played chess against many international players and was growing tired of the many types of chess set he was playing with. In some cases the set was too elaborate to actually tell which piece was which. Staunton believed this was affecting the outcome of the games and wanted a standard chess set that was used in all chess tournaments. When he saw the design of a new chess set sold by a London based games manufacturer he instantly fell in love with it, endorsed it with his name and promoted the use of the set within the tournament chess community. 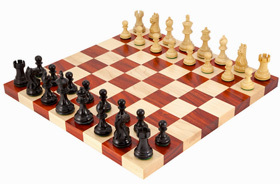 It became an instant hit and has become the most popular chess set in the world. Today all the worlds chess associations insist on Staunton as the style of set in their competitions. The design has been modified and had variants made over the years, in fact some amazingly elegant variations have been created. Today there are literally thousands of versions of Staunton chess set available. 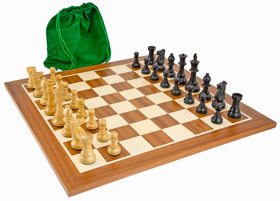 The Regency Chess Company stocks the very best sets.